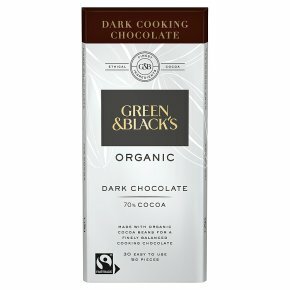 Green & Black's dark chocolate made with organic Trinitario cocoa beans for a finely balanced cooking chocolate. 70% cocoa. To make measuring easier, each of the 30 pieces of cooking chocolates weighs exactly 5g. There is also a tasty recipe on the inside of every wrapper. We buy our Fairtrade beans, at a fair price, directly from cocoa farmers in Belize and the Dominican Republic who use organic farming techniques. Suitable for vegetarians.Tasting notes Our Dark Cooking Chocolate is ideal for chocolate recipes because of its high content of cocoa solids - a combination of cocoa mass, which gives the chocolate its intense flavour, and cocoa butter, which gives it a smooth consistency for easier melting.